Vick Mickunas' interview with Beth Macy. One of this summer’s hottest books is by a writer originally from Urbana. 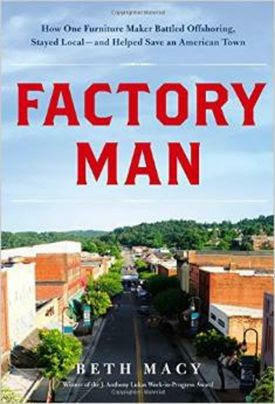 “Factory Man” by Beth Macy came out on July 15 — it is already a New York Times best-seller. Bear in mind that this is her first book. Macy is a reporter for the Roanoke Times. She was reporting on catastrophic declines in the textile and furniture industries in Henry County and Martinsville, Va., and searching for displaced workers to interview. The “Factory Man” of her title is John Bassett III (JBIII), the man who is still making furniture at his Vaughan-Bassett furniture factory in Galax, Va., employing 700 workers in an American industry that has been virtually wiped out by the impact of globalization and offshoring. The name Bassett is a familiar one in the furniture industry. JBIII grew up in a family furniture dynasty. The Bassett Furniture Company used to be the largest manufacturer of wood furniture in the world. Bassett, Va., has always been a company town. Macy details how JBIII was slowly forced out of the family business in Bassett. She delves into the complex history of the Bassett family and how globalization impacted this formerly dominant furniture manufacturer. JBIII headed down the road to Galax and employs visionary ideas that would keep his factory viable in the face of the brutal market forces that took out most of the wood furniture manufacturers in the region. The author explained to me that her book is “the story of globalization as told through the Bassett family … when globalization hit the company (Bassett Furniture) tried to fight back, they even joined John Bassett’s anti-dumping coalition. Ultimately they chose to close all their factories (in Bassett).” There had been seven different Bassett factories along the shores of the Smith River, which runs through Bassett. They are all closed now. But JBIII’s factory in Galax keeps chugging along despite cutthroat competition from places such as China. “Factory Man” is the inspirational story of a man who refuses to back down. Macy places the wood furniture industry and the Bassett family under her microscope. Readers will come away with a better comprehension of the impact of globalization. This inspiring story is a best-seller because Beth Macy did some good old fashioned reporting here.